There are three feasts spoken of in God’s word that we, as Christians are told to keep. That is Passover, Pentecost, and Feast of Tabernacles. These feasts are of great importance to the Lord, and all correspond with Christ. As we know, when Christ died on the cross for our sins, we no longer were required to make animal sacrifices. Blood ordinances were done away with because He became our Passover, and sacrifice for once and all time. Fifty days after Passover would be the time that Pentecost was celebrated. It was fifty days after Passover that God would pour His Holy Spirit on the apostles as many nations were gathered there to celebrate this feast. That day many heard the good news about Christ and believed on Him. 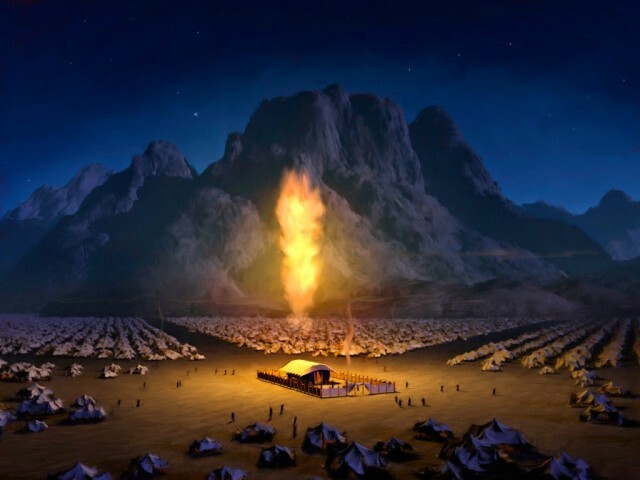 dwelling (1), dwelling place (8), dwelling places (9), dwellings (9), resting place (1), tabernacle (109), tents (1), where…dwells (1). When the Israelite’s came out of Egypt, the first town that they stayed in was Succoth (Exodus 12:37), which means booth or tents. This was the first celebration of the Feast of Tabernacles as they were celebrating being brought out of Egypt for they had been held captive there for 430 years. During this time, the Israelite’s made booths which is a small hut or tent from the boughs of goodly trees such as palm, olive, willow, ect. This was done as a reminder of God bringing them out of the wilderness, and His protection over them. Not only was this a time to celebrate coming out of Egypt, but it was also harvest time where the Israelite’s would enjoy the fruits of their labor. Where else in God’s word does it speak of keeping this feast? Let’s look at the book of Deuteronomy chapter 16. So we have once again, God pointing out the three feasts each year that we are to keep. As I stated earlier, Christ died on the cross for our sins, and we no longer have to sacrifice animals during these feasts to cover our sins. Before Christ came there were specific blood ordinances that took place to atone for sin. For that we will look at the book of Numbers chapter 29. Numbers 29:12-40, “And on the fifteenth day of the seventh month ye shall have an holy convocation; ye shall do no servile work, and ye shall keep a feast unto the Lord seven days: And ye shall offer a burnt offering, a sacrifice made by fire, of a sweet savour unto the Lord; thirteen young bullocks, two rams, and fourteen lambs of the first year; they shall be without blemish: And their meat offering shall be of flour mingled with oil, three tenth deals unto every bullock of the thirteen bullocks, two tenth deals to each ram of the two rams, And a several tenth deal to each lamb of the fourteen lambs: And one kid of the goats for a sin offering; beside the continual burnt offering, his meat offering, and his drink offering. And on the second day ye shall offer twelve young bullocks, two rams, fourteen lambs of the first year without spot: And their meat offering and their drink offerings for the bullocks, for the rams, and for the lambs, shall be according to their number, after the manner: And one kid of the goats for a sin offering; beside the continual burnt offering, and the meat offering thereof, and their drink offerings. And on the third day eleven bullocks, two rams, fourteen lambs of the first year without blemish; And their meat offering and their drink offerings for the bullocks, for the rams, and for the lambs, shall be according to their number, after the manner: And one goat for a sin offering; beside the continual burnt offering, and his meat offering, and his drink offering. And on the fourth day ten bullocks, two rams, and fourteen lambs of the first year without blemish: Their meat offering and their drink offerings for the bullocks, for the rams, and for the lambs, shall be according to their number, after the manner: And one kid of the goats for a sin offering; beside the continual burnt offering, his meat offering, and his drink offering. And on the fifth day nine bullocks, two rams, and fourteen lambs of the first year without spot: And their meat offering and their drink offerings for the bullocks, for the rams, and for the lambs, shall be according to their number, after the manner: And one goat for a sin offering; beside the continual burnt offering, and his meat offering, and his drink offering. And on the sixth day eight bullocks, two rams, and fourteen lambs of the first year without blemish: And their meat offering and their drink offerings for the bullocks, for the rams, and for the lambs, shall be according to their number, after the manner: And one goat for a sin offering; beside the continual burnt offering, his meat offering, and his drink offering. And on the seventh day seven bullocks, two rams, and fourteen lambs of the first year without blemish: And their meat offering and their drink offerings for the bullocks, for the rams, and for the lambs, shall be according to their number, after the manner:And one goat for a sin offering; beside the continual burnt offering, his meat offering, and his drink offering. On the eighth day ye shall have a solemn assembly: ye shall do no servile work therein: But ye shall offer a burnt offering, a sacrifice made by fire, of a sweet savour unto the Lord: one bullock, one ram, seven lambs of the first year without blemish: Their meat offering and their drink offerings for the bullock, for the ram, and for the lambs, shall be according to their number, after the manner: And one goat for a sin offering; beside the continual burnt offering, and his meat offering, and his drink offering. These things ye shall do unto the Lord in your set feasts, beside your vows, and your freewill offerings, for your burnt offerings, and for your meat offerings, and for your drink offerings, and for your peace offerings. And Moses told the children of Israel according to all that the Lord commanded Moses. Now we see the importance and beautiful gift the Lord gave us, by giving His only son to be our sacrifice for our sins. God doesn’t want our burnt offerings anymore. He only wants our love and to show Him his love it is important to study and know His word. Just like God wanted His children to come out of Egypt, He wants us to come out of traditions of men and false teachings taught in the pulpit today. Those traditions only make God’s word void. Satan wants God’s children to be ignorant of the true word of God, and wants us celebrating man made holiday’s instead of keeping the days that we are to truly keep. The Law was given to the Israelite’s at Mount Sinai and all twelve tribes were present, but who is to observe the law today? It is our intent to show that the Israelite’s were to be called by a new name after the dispersion and that new name would be “CHRISTIAN“. The ten tribes of Israel would be scattered, first north, over the Caucasus Mountains, into Eastern Europe then eventually throughout the whole world and would become the Christian nations of today. As they were scattered they would take with them that new name. So, who is it that is to observe the law today? Those that are called by His name, Christians. So with all that being said, Let’s take a look at John chapter 7. This was during the Feast of Tabernacles, and here the Pharisees are celebrating. They are doing things in their own traditions, not keeping to the law of Moses, and Jesus will point this out to them. John 7:14-38, “Now about the midst of the feast Jesus went up into the temple, and taught. And the Jews marvelled, saying, How knoweth this man letters, having never learned? Jesus answered them, and said, My doctrine is not mine, but his that sent me. If any man will do his will, he shall know of the doctrine, whether it be of God, or whether I speak of myself. He that speaketh of himself seeketh his own glory: but he that seeketh his glory that sent him, the same is true, and no unrighteousness is in him. Did not Moses give you the law, and yet none of you keepeth the law? Why go ye about to kill me? The people answered and said, Thou hast a devil: who goeth about to kill thee? Jesus answered and said unto them, I have done one work, and ye all marvel. Moses therefore gave unto you circumcision; (not because it is of Moses, but of the fathers;) and ye on the sabbath day circumcise a man. If a man on the sabbath day receive circumcision, that the law of Moses should not be broken; are ye angry at me, because I have made a man every whit whole on the sabbath day? Judge not according to the appearance, but judge righteous judgment. Then said some of them of Jerusalem, Is not this he, whom they seek to kill? But, lo, he speaketh boldly, and they say nothing unto him. Do the rulers know indeed that this is the very Christ? Howbeit we know this man whence he is: but when Christ cometh, no man knoweth whence he is. Then cried Jesus in the temple as he taught, saying, Ye both know me, and ye know whence I am: and I am not come of myself, but he that sent me is true, whom ye know not. But I know him: for I am from him, and he hath sent me. Then they sought to take him: but no man laid hands on him, because his hour was not yet come. And many of the people believed on him, and said, When Christ cometh, will he do more miracles than these which this man hath done? The Pharisees heard that the people murmured such things concerning him; and the Pharisees and the chief priests sent officers to take him. Then said Jesus unto them, Yet a little while am I with you, and then I go unto him that sent me. Ye shall seek me, and shall not find me: and where I am, thither ye cannot come. Then said the Jews among themselves, Whither will he go, that we shall not find him? will he go unto the dispersed among the Gentiles, and teach the Gentiles? What manner of saying is this that he said, Ye shall seek me, and shall not find me: and where I am, thither ye cannot come? In the last day, that great day of the feast, Jesus stood and cried, saying, If any man thirst, let him come unto me, and drink. He that believeth on me, as the scripture hath said, out of his belly shall flow rivers of living water. Jesus waited until the middle of the feast to speak because it was finally His time to, and when He did, He did so boldly! These Pharisees were questioning Him on how He knew the word of God to teach it because He didn’t go to their schools of religion. He didn’t need to, Jesus is that living word, and He is making it very clear in these verses. These Pharisees were going around plotting to kill Jesus when the law said thou shall not murder. They were outwardly looking all religious and spiritual with their fancy traditions, and at the same time seeking to kill Jesus. Part of the religious practices of those Pharisees, and those who practice Judaism today involves pouring water and wine over their sacrifices, and on the eighth day of the feast they would not draw water from the well. When Jesus says to them they that are thirsty come to Him and drink, and those who believe on Him, out of his belly shall flow rivers of living water, He is referencing Isaiah 12:3. Those who come to Him, and believe on Him will receive salvation! That is the key, and His whole purpose of coming. No more traditions of men, no more sacrificing animals. Believe on Him, repent and turn from your sins, and you will be redeemed! Satan does some of his best preaching from the pulpit today. Misguiding people through false preachers and false teachings so that they won’t understand where they came from or the days the Lord has told us to keep. He knows God’s word, but twists it right at the end because his ultimate goal is to deceive. That’s why many don’t know the true date of Christ’s birth, it’s why they celebrate man made holidays that have nothing to do with the word of God, and it’s why when he returns at the 6th trump pretending to be Christ, most will follow him because they don’t know that the true Christ returns at the 7th trump. It’s why many people think they are going to fly out of here in a false rapture that is no where in God’s word. There is an easy solution to this. Study God’s word to show yourself approved. Only when you do this can you rightly divide it. We aren’t supposed to put our trust in any man, only trust in God. Even with our teachings, we ask that you research and study these things yourself. We pray that this teaching has been a blessing to you, and that it has opened eyes and ears today regarding the Feast of Tabernacles! Thank you Heavenly Father for giving Your only son so that we may be saved! We are so grateful for your mercy, love and forgiveness!